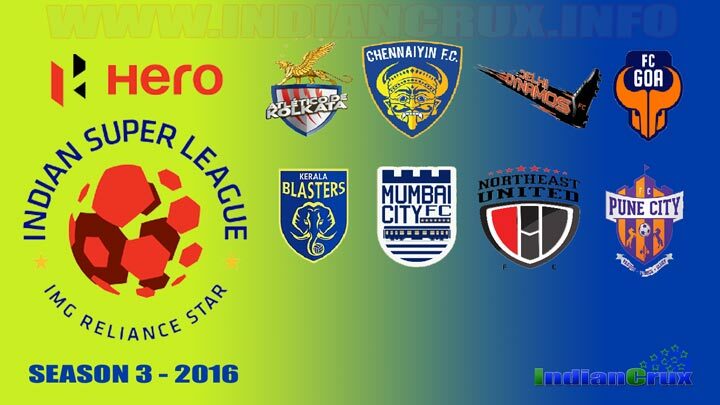 Indian Super League is now at third edition, Starting in 1st October 2016. There are eight teams are participating in this season. Here is the complete Point Table of ISL 2016 (Season 3). Kolkata, Chennai, Delhi, Goa, Kerala, Mumbai, Assam (North East) and Pune are the eight teams who participating in ISL Season 3. Point table is listed here as usual, every wins gives three points to winning team and a draw gives one point to both teams . Only four teams who scored more points will advance to semi final of Indian Super League. This Point Table of Indian Super League 2016 is showing the team standings with number of wins, loss and ties. In last season, in 2015 Indian Super League, Goa was the group winner at point table with 25 points. Goa had won 7 matches and tied in four matches. Kolkata, Chennai and Delhi are other three teams, who advanced to semi final with after Goa in 2015. However in final match Chennaiyin FC had beaten by 3 - 2. Indian Super League 2016 Point Table (ISL Season 3) listed above is written by Indiancrux.info which is referenced from official portal of ISL 2016. If any mistakes or error found in this post please comment below to contact the author. NorthEastited FC and Mumbai City FC are leading at ISL 2016 Point Table. Goa FC and Kerala Blasters are at the bottom with with two looses in first two matches.